We recently spent the weekend at Lares Hot Springs, about 3 to 4 hours journey from Cusco (Peru, in case you’re wondering). While not the easiest place to get to (it’s a tummy-churning bus trip to the Sacred Valley, then another more nausea-inducing bus up then down a mountain pass), it was actually well worth the journey. The vistas are spectacular along the way, as they typically are around the Cusco mountain region. And as we veered along switchback after switchback, I tried to enjoy the Middle Earth-like view and ignore the nausea that was churning around like a little tornado in my belly. *** Side note: I’m a bit (more like a lot) sensitive to motion and can no longer enjoy the amusement park roller coasters I used to love in my youth. Long and winding mountain drives give me a similar spinning feeling in my gut (which, of course, is ironic because I live in the mountains). Anyway, I digress…. Seriously, once we arrived, there was no regret. At 3900m above sea level, the Lares thermals are literally in the middle of nowhere with lovely manicured gardens and six thermal pools, all varying degrees of hot and cold. And it got me thinking about all the wonderful benefits of the world’s thermal pools, warm ponds, and hot springs, and how fortunate I’ve been to have visited some of them. A natural thermal bath, or hot spring, occurs when water seeps deep underground into volcanic soil, and then rises to the surface, heated and full of minerals. There is an actual term for the use of hot spring water for health and healing. It’s called balneology. And in some countries, people have regular thermal baths as part of their healthcare regime – mmm sounds nice. What are the benefits of soaking in natural hot springs? Anyone who enjoys soaking in a hot bath understands the allure of relaxing in a natural hot spring. Sinking into a warm or hot pond is like surrendering into a pool of warm hugs. It feels really nice and you kind of want to stay there forever. And not only are they relaxing, thermal baths are said to have numerous therapeutic, healing, restorative, and rejuvenating benefits as well. The heat of the water relaxes the muscles and the buoyancy just may put you into a calm and meditative state, relieving anxiety and stress. The hot air from the springs may bolster the respiratory system, like a sauna or steam bath. The bicarbonate characteristic of thermal baths can improve circulation and hypertension. The sulphur in hot springs can treat skin ailments like acne, rashes, eczema, psoriasis, rosacea, and dry scalp. The high concentration of mineral salts can help with the regeneration of skin cells. The magnesium, calcium and potassium in many thermal water pools help reduce heat, inflammation and sensitivity. The neutral pH of mineral waters helps to restore balance to the skin’s pH. A hot thermal bath may improve the nervous system and aid the body’s detoxification processes. Soaking in a thermal spring may help your body fight infections. 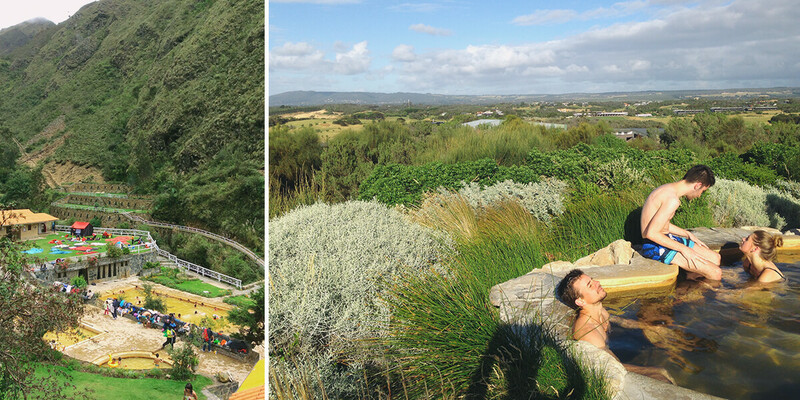 We try to the get to the Peninsula Hot Springs whenever we’re in the Mornington Peninsula visiting family. It is a tranquil oasis just 90 minutes from Melbourne. There are more than 20 bathing experiences at the Springs including a hilltop pool with an incredible 360-degree view, a reflexology walk, a Turkish steam room, a sauna, and a cave pool. If you’re lucky and you come on a quiet day (i.e. not weekends or holidays), you might have the hilltop pool to yourself. The views are spectacular. And if you can, combine the springs with a relaxing Kodo massage. I did and it was well worth it! We did a 3-month road trip across Australia in 2010, and after those long drives through the bush, nothing could have been better than to stretch out in a thermal pool. There are two options. Both are located in Elsey National Park. Of the two, Rainbow Springs (aka Mataranka Thermal Pools) is more popular, probably because of its shallower waters and family-friendly design. Bitter Springs is a bit more rustic with deeper waters. You can actually swim downstream to a bridge, then take a leisurely stroll down a shaded path back to the main spring. 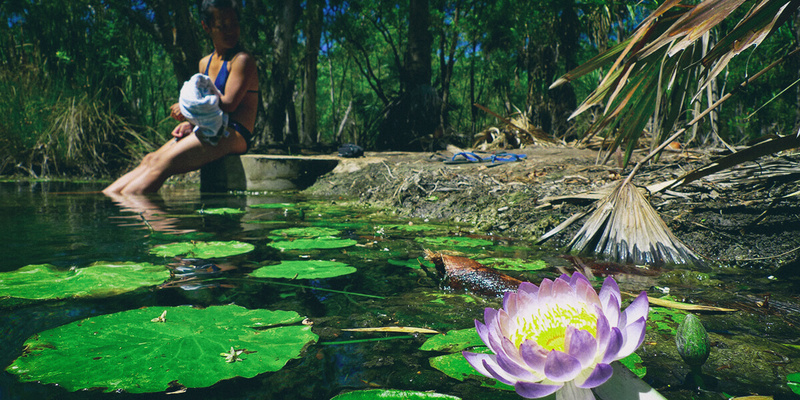 While Katherine is maybe better known for Katherine Gorge, the Katherine Hot Springs are a great place to go for a relaxing soak in warm water (as opposed to the fresh cold water of the Gorge). The water is a bit cooler than Mataranka at a comfortable 32C and was designed with family in mind, with concrete steps, wheel chair access, and stainless steel rails. Pandanus trees line the area keeping it shady and perfect for a lazy day swim. Another great find during our 3-month Australia road trip! How lucky can you be when the public swimming pool is an Olympic-size natural warm pond right by the ocean? When we lived on the Big Island in 2012, this was our regular local haunt as it is with most of the residents in the area. 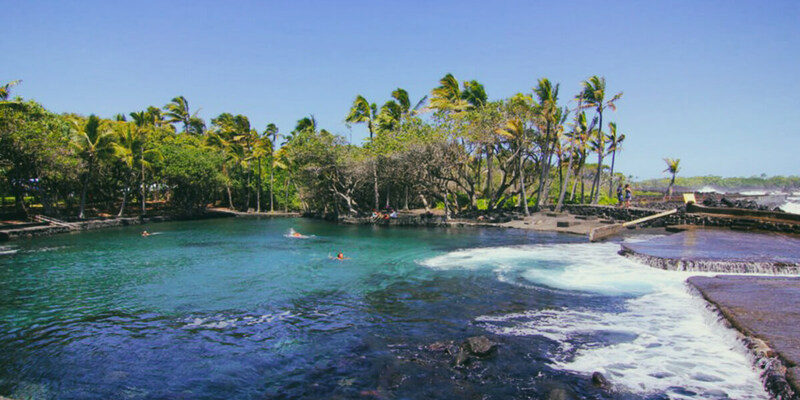 All of the Big Island is volcano – both active and dormant – so there are numerous hot springs and warm ponds all over the island, some officially-recognized, while others remain the secret of the locals in the know. 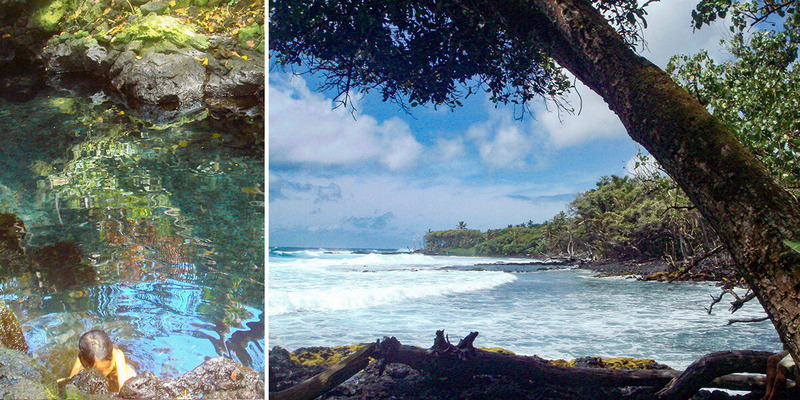 Ahalanui Hot Spring (also called Pu’ala’a) is one of the most popular and more developed. Located on the Puna side of the Big Island, there’s even a lifeguard there most of the time. The spring has a narrow outlet to the ocean, so the cold water from the ocean cools the waters to a comfortable warm temperature. This is seriously one of the world’s best swimming pools! The swimming pools of my childhood were normally indoors, freezing cold and full of chlorine and kiddie pee. They definitely didn’t look like this. Also on the Puna side, Pohoiki Warm Pond in Isaac Hale Beach Park is a tiny little pond tucked away and shaded by trees but close enough to the ocean to watch the surfers ride the waves. I loved coming here when I was on the Big Island. It’s small and intimate, and slightly secluded. It’s like a natural jacuzzi by the ocean. What’s not to love? A friend first brought us to this hidden gem, again on the Puna side of the Big Island (this is obviously where it’s all at). The pond is located within a gated community. So in order to get there, you have to park your vehicle outside the front gate. From there, it’s a 20 minute walk. And totally worth it. Fed by the Pacific ocean sitting right at its doorstep, the pond is nice and warm, becoming cooler as you swim closer to the oceanside. Snorkel gear is a must here. You just might be lucky enough to swim with sea turtles! The highest thermal bath I’ve ever visited was in the Altiplano of southwest Bolivia during a multi-day tour to the otherworldly Salar de Uyuni and the Lagunas Coloradas in the region of Sud Lipez – 4500m above sea level and surrounded by nothing but the Dali Desert with its hot geysers, multi-coloured lakes, vicunas and flamingoes (yes, flamingoes). It’s hard to believe that in this high-altitude dry desert landscape, there is a plethora of natural thermal pools, heated by dormant volcanoes. Here, the sun is fierce and the wind has bite. The warm waters of the thermals are comforting against the cold air but it’s hard to escape the sun’s rays. Sun screen and a hat are a must. I simultaneously wore a winter hat (toque or beanie depending on where you’re from) and a bikini. Years ago, I ventured off to Costa Rica with my friend Linh where we discovered the Arenal hot springs. Thanks to the Arenal Volcano’s geothermal activity, there are a number of natural hot springs throughout the area. Warm and soothing, in beautiful rainforest surroundings, we spent the evening at the Tabacon Hot Springs, a luxury resort and spa. Moving from pool to pool and eventually ending up under a waterfall, the evening ambience gave our experience both a mystical and festive feel. Last year, Shane and I wandered over to the pretty mountain town (and popular US retirement community) of Cuenca, Ecuador and our Airbnb hosts – the lovely Josh and Lynsey – recommended that we check out the hot springs in Banos de Cuenca close by. It’s an easy local bus (take bus 11 or 12) or taxi ride about 30 to 40 minutes outside of town. 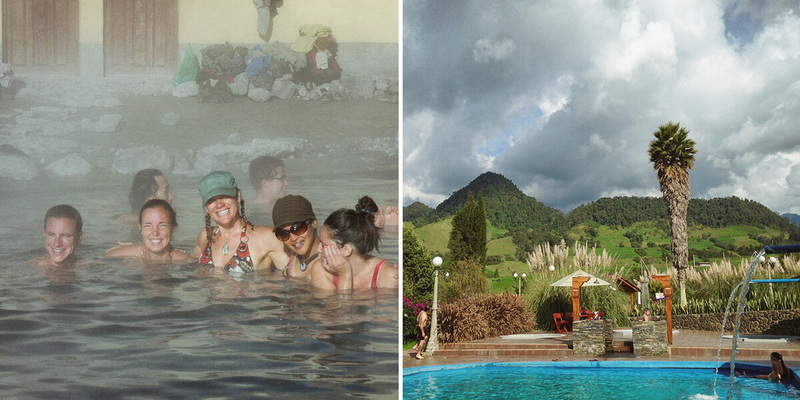 Like Arenal in Costa Rica, there are a few options as far as enjoying the springs in Baños de Cuenca. We went to Piedra de Agua Hot Springs and Spa. Beautifully-landscaped and muy tranquilo, we spent the day enjoying the entire spa circuit, which includes a dry sauna with aromatic leaves, a vapour steam box (you actually sit in a box with your head poking out of a hole), two volcanic mineral mud pools (a red one and a blue one – know idea what the difference is), plus the thermal pools (one that’s underground, a cold plunge, two outdoor thermals, and a swimming pool). Best part, you can stay as long as you like! 2016 was the year we fell in love with Colombia. We spent 3 months of 2016 exploring this vibrant country and discovered (among so many other things) that it too has it’s fair share of thermal baths. We went to a few and found that some were better than others. One of the more well known, Termales Santa Rosa de Cabal, had incredible natural beauty but was overcrowded with latin dance music playing at full volume. Not really our scene. One of our favourites however, located in the rolling hills of the Caldas department a half hour outside of it’s largest city, Manizales, is the Termales del Otoño. There is something serenity-inducing of a backdrop of rolling hills. It really does seem to immediately calm the soul. Though it’s part of a hotel and conference centre, we visited on a quiet afternoon and were able to fully relax, enjoy and take in the beautiful view. So now I would like to apologize for the lack of photos accompanying this post. But I’m sure you understand how hard it is to remember to take photos when you’re busy relaxing in the hot springs. I wonder if Toronto has any hot springs because that’s where we’re headed and I sure could use another soak. That might be wishful thinking.